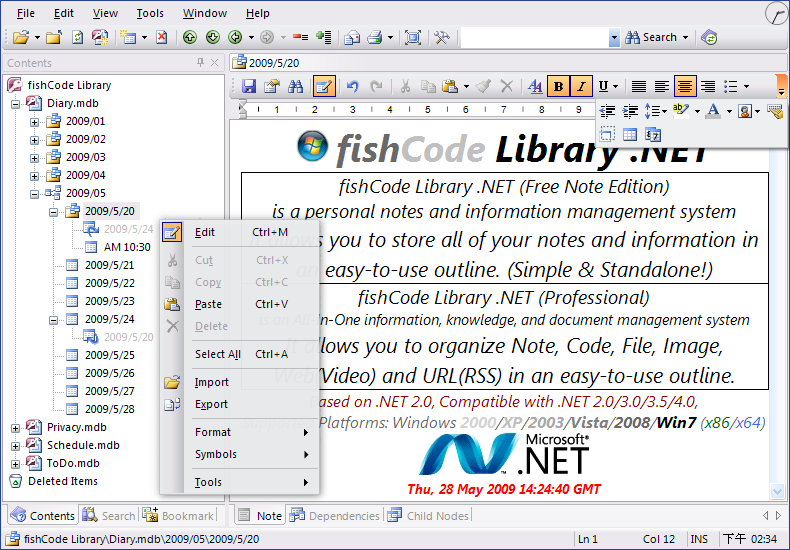 Library .NET is the most comprehensive information and document management system that allow you to organize Note, Code, File, Image, Web(Video) and URL(RSS) into an easy-to-use outline format. Making your data more complete and convenient management, quicker and exact search, simpler and flexible backup, clearer and intuitive interface. 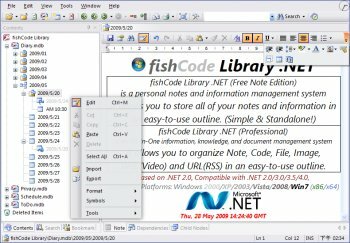 Features: multiple databases open at same time (Unlimited Databases and Nodes), All-In-One, Download Manager, Depend/Merge/Move/Protect/Bookmark/Print nodes...and more., Import/Export node information from/to xml/txt/rtf files., Import/Export note information from/to txt/rtf/htm/mht/doc/xml/odt/pdf/xps file., Full-Text Search (Google-like search e.g: aa bb cc, "aa bb" cc), Full support of Unicode, Drag and Drop Everywhere, History navigation...and more. Love this ap. Pics work much better now albeit no sideway scrolling so larger than gui ones will get cropped. Easy to use unlike others I have mentioned which are far more complicated. Alternatively try rednotebook or wikionastick. Large pictures imported into note will not look good at all. at least on my system. Haven't used this, but if it's anything like Dictinary.net. It will be outstanding.